With trends showing up practically overnight, it can be pretty stressful on your wallet to catch up. Especially when you're trying to be frugal! But it's honestly not worth stressing over. Trends are just current crazes. Nothing on a trend says that you need to buy it. Especially if you hate it! I skip certain trends all the time! It's your style. Dress how you want to. Not how the world wants you to. 1) Spend Less On Trends That Will Fade! If you like a trend, but don't think it will last past the latest season, don't waste your money splurging on it! Focus on accessories that cost less but appear high quality. Target is one of my favorite places for items like this. 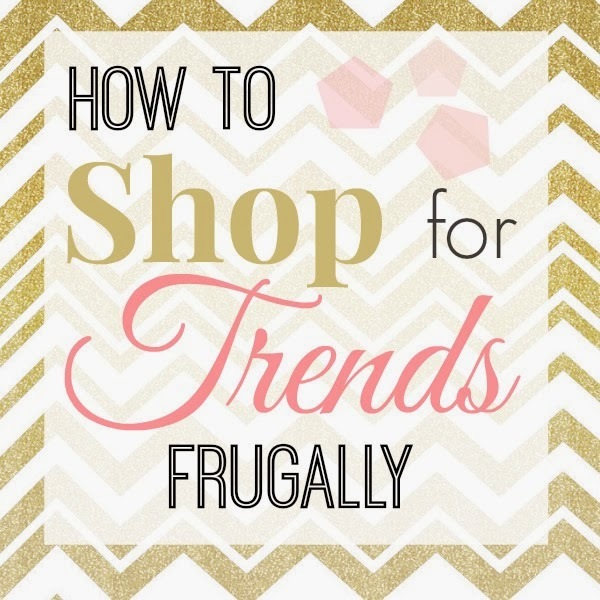 2) Spend More On Trends That Will Stick! I think this one is pretty obvious. If you think a trend is really going to stay around for a while, say...ankle boots, spend a little more on them! Instead of buying cheap ankle boots over and over every Fall when they break, you can own a great pair that will end up lasting you those three years! You can get great expensive items for less at stores like TJMaxx or websites like Rue La La. 3) Just Because It's A Trend, It Doesn't Mean You Need It! Companies want you to fall for impulse buys. If you see something in a store you can't put down, walk around with it for a while. Then, before you go in line, think to yourself, "Do I really need this? Or do I just want this?" I've done this a lot and by the time I get to the register I usually don't want the item anymore. 4) If You Really Want It, Wait! This one might sound crazy, but if you really want something that's way out of your budget...give it a few months and keep your eye on it like a hawk. Eventually all items go on sale, and when yours does your wallet will be much more happy with the new price. I did this recently on an H&M top. I really wanted it in December but it was $30 for a t-shirt which seemed overpriced. I purchased it in May for $9! Have any other great tips? Share below! I'd love to hear! !